While doing my cardio yesterday, I looked up at the clock and realized an hour had flown by. The best thing about it? I wasn't about to stop. Perhaps I've conditioned myself, since the gym consumes most of my life, when I'm not working or writing. Or maybe it's the play list on my iPod. I can't help but do a little head bob or a few snaps of the finger while running. Yes. Others may think I look a little silly, or perhaps think I am having convulsions, but they just aren't having as much fun. Hey, I never said it wasn't one with variety. 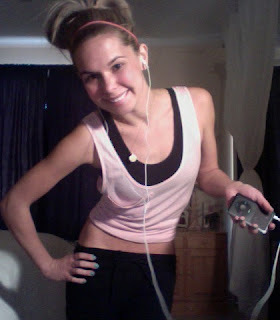 Off to the gym I go. I am trying to lose weight and your story is soooo inspiring. I can not seem to get into cardio = boring.. What EXACTLY is it that you do at the gym? your regimen Monday-Sunday? Ready, Go! I eased myself into the gym, but now I do a minimum of and hour to an hour and a half of cardio. I warm up on the treadmill on the highest incline, then move to the elliptical. I also am a fan of resistance bands and kettle bells. Be patient and stay motivated. I am here for any motivation. Along with being skinny, how do you get over an ex!? I believe focusing on yourself is key. Work on your happiness. Throw yourself into hobbies, surround yourself with the friends who love you, and put the necessary space between you and your ex. Remember everything happens for a reason. ps. an hour to an hour and a half/ day of cardio?!?!? !